While time is going by quickly, we’ve been making monumental leaps with our technology and vision by changing the way people play. First, we started by bringing video games to the web, doing away with the old download-per-machine approach that has become all too common from competitors. Also, we’ve never been comfortable with the idea of Rainway just being a glorified remote desktop, after all, we pivoted away from that — we needed to do better, and so we did.. That is why we pushed through with our ‘games first’ approach, building out the technology necessary to find and manage all of our user’s games. By enabling this instantaneous click-and-play experience, we broke down yet another barrier and removed a lot of the friction that comes with gaming remotely. 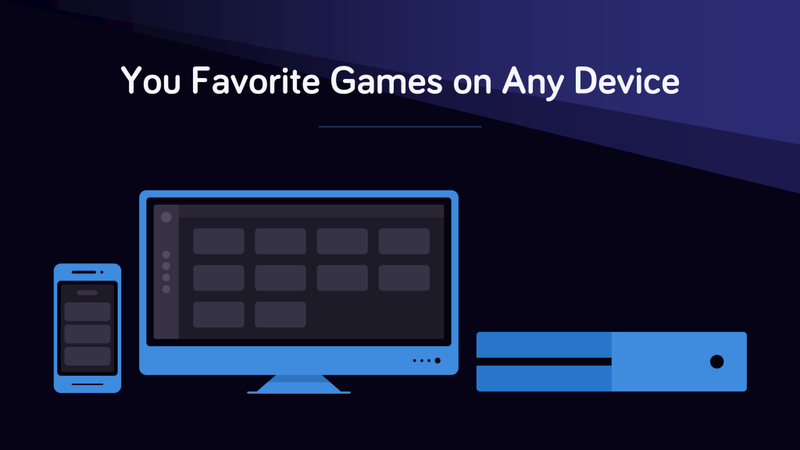 No IP addresses, no port forwarding, no mind-numbing configuration — just games. The hard work and dedication put forward by the Rainway team produced results like no other. We have seen games like Dark Souls 3 on Linux, Battlefield 1 on a Macbook, even games like Street Fighter have no problem running on Android through a browser using Rainway. However, our work is never done. We are constantly looking for new and better ways to improve our software and user experience. That is why today I’m happy to share with you all the first look at a brand new Rainway. What you see now is the new Rainway Dashboard. 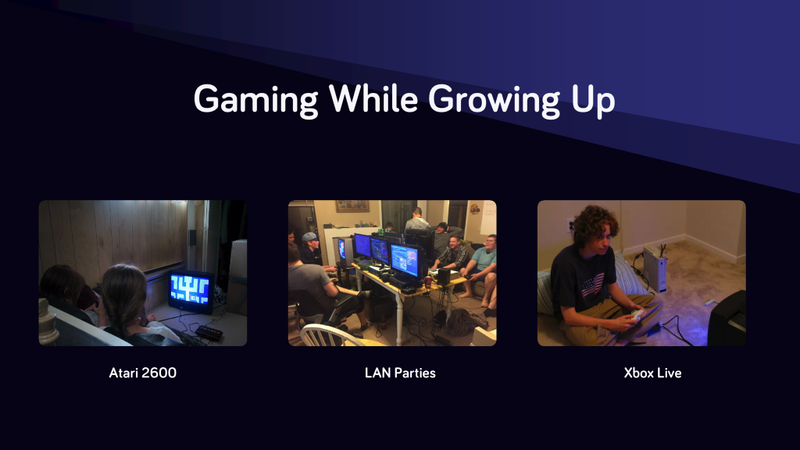 No longer is it just a boring panel with a few configuration options; now it serves as a dedicated hub for all things gaming. We’ve glued together the fragmented PC ecosystem by allowing users to launch and manage all of their games from Rainway on their local system. Now, they don’t need to open dozens of different platforms to start specific games; they just need to click once, using us. We are also introducing true multi-host support. 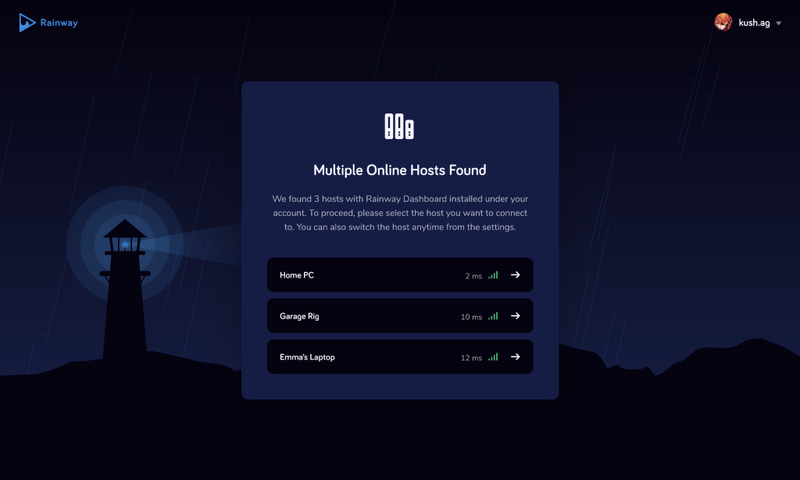 This means users can have the Rainway Dashboard installed on all of their rigs, from their main gaming PC to an Azure instance in the cloud with no more hassle. We’ve also spent a lot of time figuring out the best way to introduce more social features. We genuinely believe whether they’re competing or cooperating, gamers thrive and have more fun when playing together. So, we started remembering what it was like to play growing up… Nostalgic long nights on the couch until 3 am, playing ‘Adventure’ on the Atari 2600. Weekend-long LAN parties with friends crammed into a tiny room. Or solo gamers meeting and discovering new lifelong friends on platforms like Xbox Live. How does one capture that experience and apply it in a modern age? With that in mind, we’re thrilled to introduce our solution to this problem — Rainway Party. 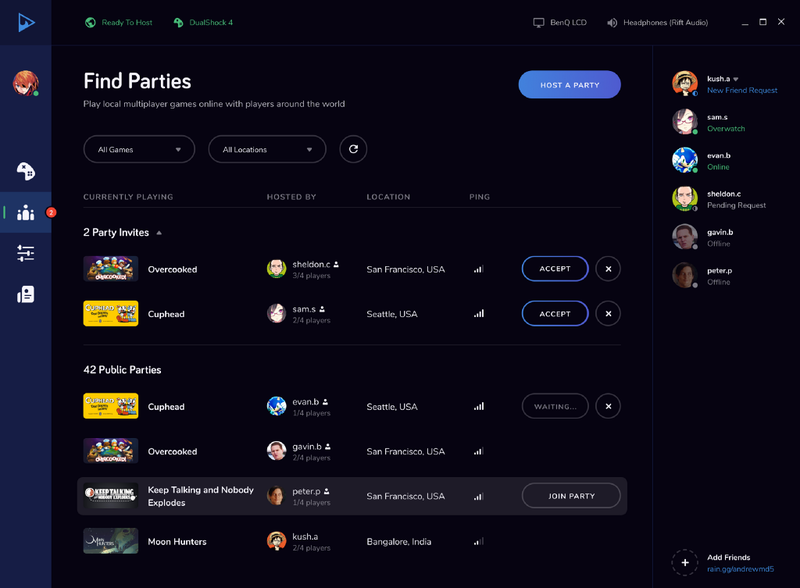 Party lets users play any game they own online with their friends, or they can discover other gamers around the world and request to join their Party. 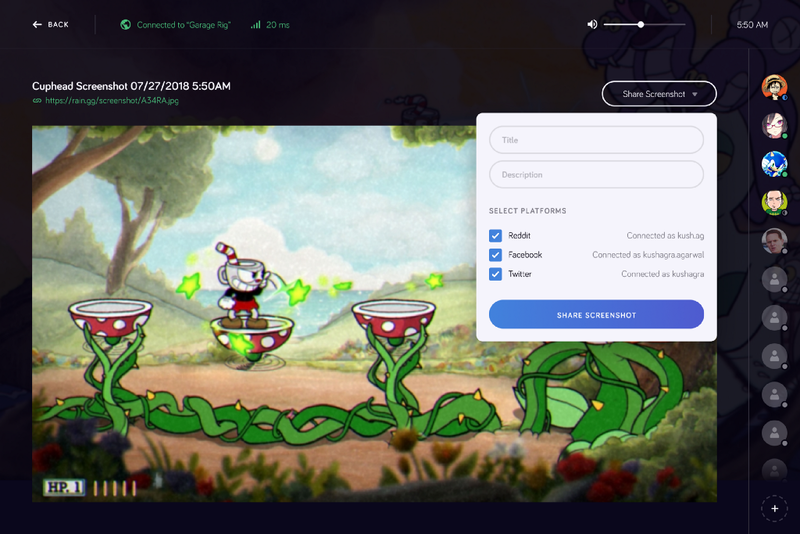 We do this without needing any extra downloads or installations so you can immediately invite your best friend to play some Cuphead. Even when you’re hundreds of miles apart. 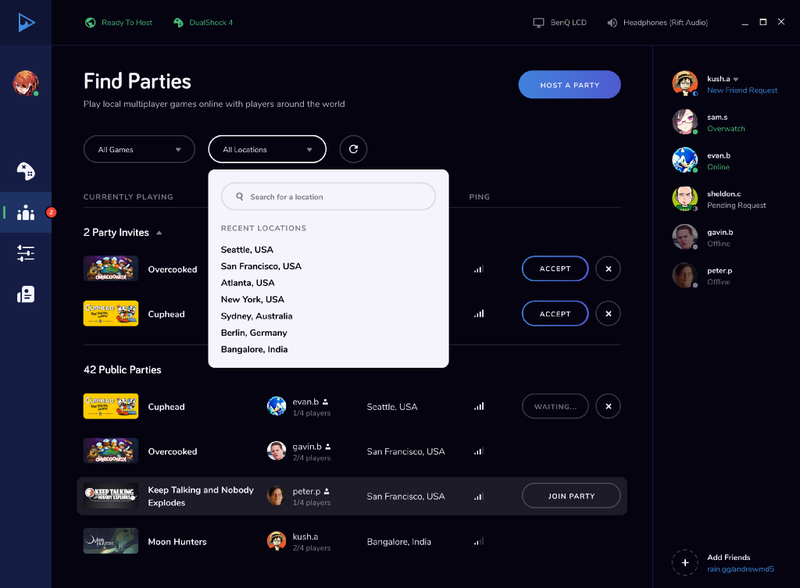 You can quickly filter Parties based on their location or the very game they are playing. Our goal with Party is to bring people together and turn any game into a cross-platform multiplayer experience. Giving users the ability to discover and fall in love with new games, meet new friends or even get help from existing ones when they’re having trouble on a particular level or boss. 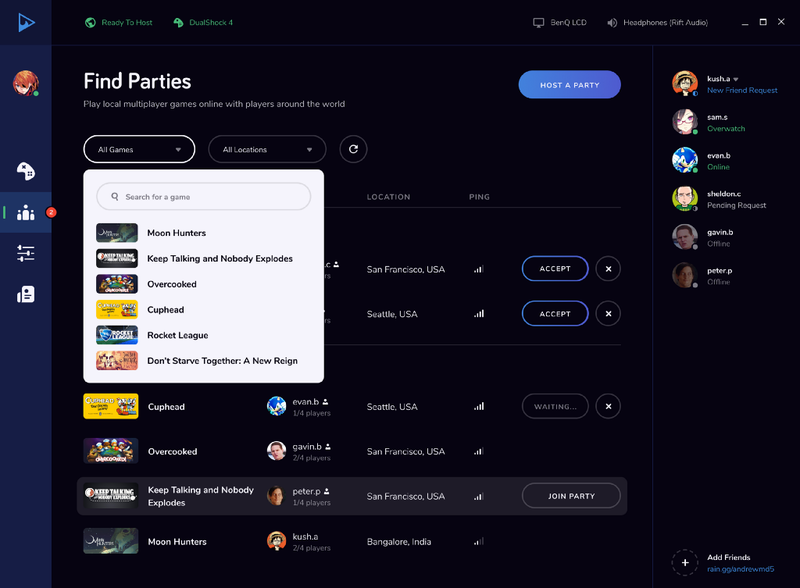 Even better, because Rainway is based in the browser, you’ll be able to discover parties no matter where you are, just login and play. We understand while playing all these games some share-worthy victories or glitches are bound to happen. So we’ve overhauled our media sharing functionality so users can instantly share their glorious moments to all their social media in a single click. Our mission from the start has to been to bring PC games to as many screens as possible. Empowering users to play when they want, how they want, wherever they want. As part of that mission, we are actively developing our native Android application and plan to release it later this year for Android smartphones, tablets, and smart tv platforms. I’m also happy to share that our first major game console release will be for the Xbox One in Q1 of 2019 — enabling all Xbox One owners to play their PC games on the console. Finally, we want to embrace the best part of the PC platform — its openness. We will be creating official images on services like AWS and Azure so users can instantly deploy Rainway on a virtual machine and have a true cloud gaming experience. 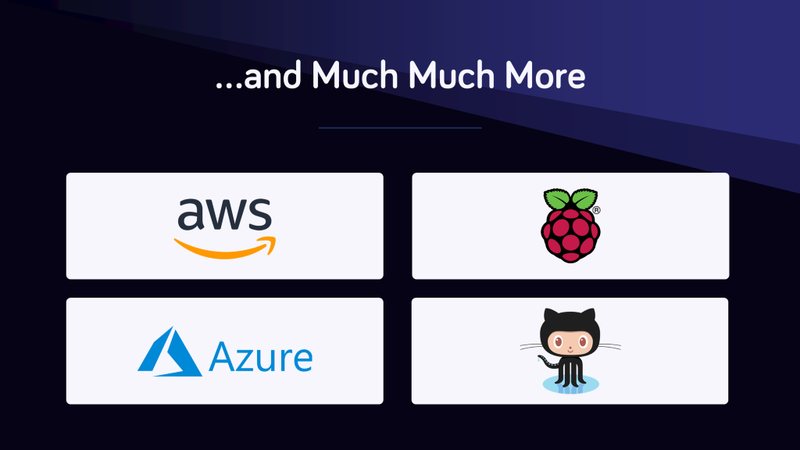 We will also be releasing downloadable versions of the Rainway client to make the user experience on platforms like the Raspberry Pi easier, as well as deploying new automation interfaces to the Dashboard so developers can build cool software around Rainway for their communities. 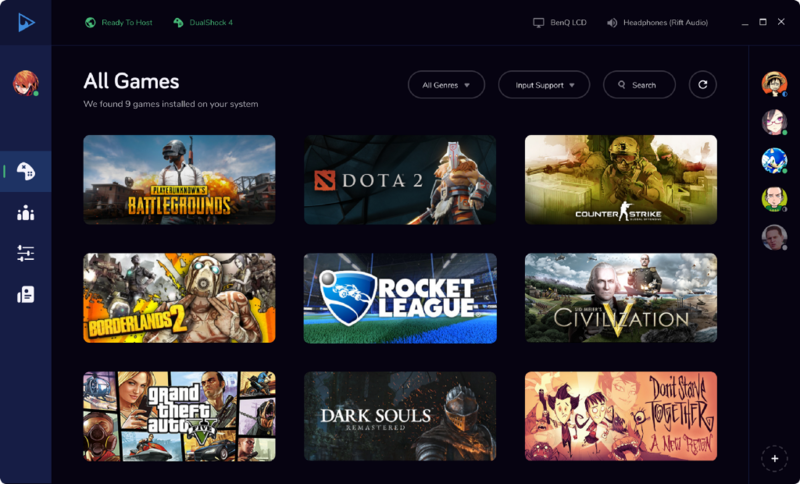 At Rainway, we no longer see ourselves as just a “game-streaming platform.” We want to be the best gaming application you have installed that meets all your needs — be it playing remotely, playing with friends or just managing your vast library of titles. We will continue to evolve as time goes on and always pursue being the best product out there. All of these exciting new updates should be live in the coming weeks, however, in the short term the next major update hitting Rainway is a huge performance patch to MSG. We will write about that in another blog post but let me just say, it’s so fast we had to check if our benchmark tools were broken. Finally, over the next few weeks we are going to be focusing all our efforts on development. So if we seem a bit more quiet than usual, we are just hard at work. We hope you enjoyed this quick look at what is to come and thank you all for your continued support. We’re building Rainway for the community and we hope you’re as excited as we are for the future.